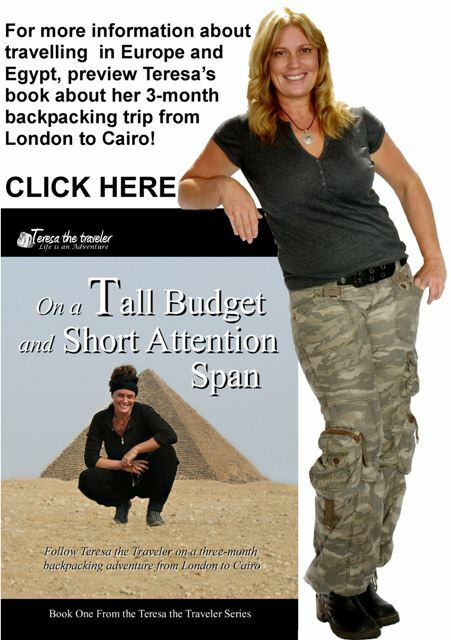 Excerpt from the book On a Tall Budget and Short Attention Span from the Teresa the Traveler Series. 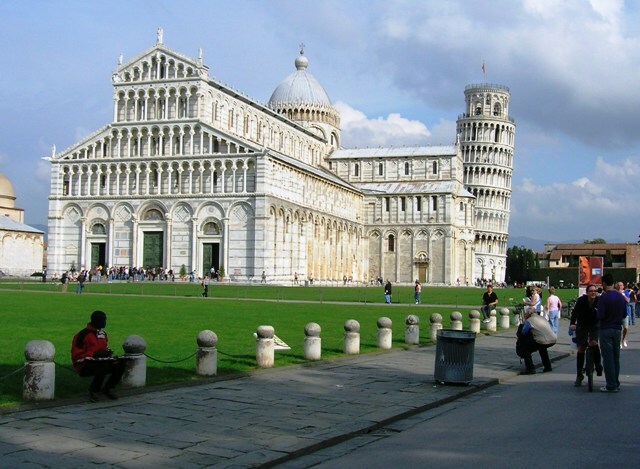 The following morning I went to Pisa for one reason and one reason only: to visit the Leaning Tower of Pisa. When I was a child, I remember playing with a small plastic model of the tower at my grandparents house and now I was about to see the real thing. Bonano Pisano started the tower in 1173 but, after it reached thirty-five feet, the ground subsided causing the tower to lean six inches. He tried unsuccessfully to correct the tilt on the fourth floor before finally giving up. In 1234 Wilhelm of Innsbruck added three more floors bringing the structure to seven floors and then in 1350, Tommaso Pisano added the bell chamber thus completing the tower. The inclination, which increases by one millimeter a year, has been corrected by engineers over the years. At one point they even proposed straightening the tower but the Pisans got very irate claiming they would rather see the tower fall to the ground than be straightened. I arrived in Pisa around 10am; a thirty-minute walk from the train station brought me to the world famous tower. Much like the Mona Lisa, it was smaller than I had imagined. I think that is because when an object becomes famous, people perceive it as being larger than life and no matter how large it really is, it will always seem smaller in real life. I went to the ticket booth hoping to buy a ticket to climb the tower and, as luck would have it, the tower was open to the public. Every forty minutes twenty people were permitted to enter at a cost of 15 Euros each. I signed up for the 3pm showing. After checking my bags in the locker room, my group and I were herded up the circular staircase by the “Pisa Nazi”, a stern-looking woman who constantly reminded us not to over stay our forty-minute time limit. Because the tower has a lean, climbing the steps gave me the sensation of being drunk. I was not able to walk straight. My time at the top platform was short and after about 10 minutes of admiring the view the “Pisa Nazi” ushered us out to make room for the next group. On the roof, I met two Canadian women who showed me the spot where people stand for the Pisa Tower pose. 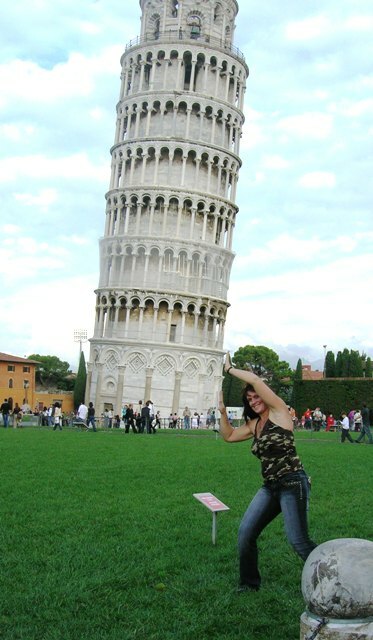 My visit was not complete until I positioned myself in exactly the right place to make it appear as though I was holding up the tower. One of the ladies took my picture so I could email it to my friends.I spent the next few hours visiting the other churches on the grounds then when I was done I tried unsuccessfully to find a room in Pisa. Apparently, students attending the local university rented all the budget hotel rooms making it very difficult to find an available room. After being told there were no vacancies at six different hotels I was afraid if I didn’t think fast I would end up sleeping in a dumpster. I hopped a train to Sienna hoping to find a room before it was too late.